Somewhere in Texas is a sword with a history. The long steel blade could be rusting in an old trash dump, it could be hanging on someone’s wall or it could be for sale at a gun show. No one knows and most likely, no one ever will. What is known is that the sword’s first owner lost it twice. And each time made him justifiably angry. The sword, probably a piece of Civil War surplus property, was issued in the mid-1880s to Capt. Charles Vernon Terrell, second-in-command of Decatur’s volunteer militia company, the Decatur Rifles. In 1888, Terrell’s company, along with other guard units from across the state, converged on Austin to march in the parade following the dedication of the new red granite capitol. That’s when he got an unusual request, albeit one he couldn’t very well turn down: Sen. Temple Houston, son of the first president of the Republic of Texas, wanted to wear a sword as he led the parade. The young captain wasn’t too keen on being the only sword-less officer in the Congress Avenue procession, but like a good soldier, he unbuckled the belt and scabbard that held his sword and handed it over to his company commander, Maj. Tully A. Fuller. The major outranked Terrell when they had uniforms on, but in civilian life Tully was Terrell’s friend and law partner. Fuller, in turn, took the sword to Sen. Houston. The Panhandle senator, first elected to the Legislature in 1884, had not chosen the Decatur militia company at random. Houston met Fuller when the Decatur lawyer was serving in the House of Representatives. The two had worked closely together in defeating an effort to impeach a district judge from the High Plains. In the process they became friends, so it was natural enough that Houston approached Fuller for the loan of a sword. After the parade, Capt. Terrell and the other militiamen attended the final dedicatory event of the day, a grand ball. At some point, presumably the following day, he went to retrieve his sword. To his chagrin and Houston’s embarrassment, Terrell learned the senator no longer had the sword. He had lost it, he said. 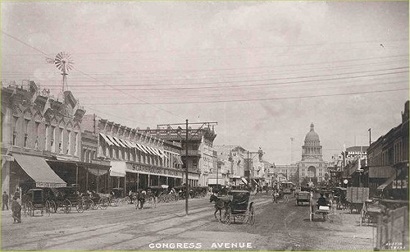 Whether Terrell questioned the senator enough to learn that he had gone on a toot the night before or whether the young lawyer figured it out on his own based on Houston’s obvious signs of a hangover, Terrell walked down Congress Avenue to check the saloons. Sure enough, he found his military gear at a popular Capital City watering hole. Terrell stayed in the Decatur militia company through the Spanish American War, but did not see service in Cuba. Though no longer a citizen-soldier, he kept the belt, scabbard and sword. After all, it had been worn by the son of the man who assured Texas’ independence from Mexico. The North Texas lawyer moved to Austin in 1921 to be sworn in as state treasurer during the administration of Gov. Pat Neff. In preparing for the move, Mrs. Etta May Terrell came across the old sword. Having no idea of its historical value, she “disposed” of the sword without consulting her husband. The judge had intended the long-obsolete sword to go on display in a museum, someday, but this time he had no luck in finding it. Just how his wife got rid of it was not reported when the then 92-year-old Terrell (he lived another six years) relayed the story to a young reporter in Austin in 1953. But the sword worn by Sam Houston’s son on the day of the Capitol dedication remains missing.